Thermochemical materials (TCMs) used in storage tanks show higher heat capacities than water and smaller losses over time. They are crucial to an increase in solar use among consumers and the storage of summer heat for the winter season. However, they are also more complex than their water-based counterparts, which require only heat exchangers. Conversely, TCM storage units additionally need mass exchangers to make sorbent-sorbate interaction possible. Research into TCM storage has so far been coordinated by the IEA’s Solar Heating and Cooling Programme’s Task 58, Material and Components for Thermal Energy Storage. Solarthermalworld.org spoke with Benjamin Fumey, Researcher at EMPA – Swiss Federal Laboratories for Materials Science and Technology, about the technology. Fumey heads the Task 58 research group focused on Component Design for Thermochemical Materials. The operation of the specially designed heat and mass exchanger will be explained throughout the interview based on a TCM storage tank with sodium hydroxide as the liquid sorbent. Important technical terms can be found in the glossary at the end of this article. Solarthermalworld: Why is it so important to focus TCM research on components? Fumey: During the previous IEA SHC tasks on compact storage tanks – Task 32 and 42 – we observed a remarkable decline in storage capacity between the values that we measured in the lab based on a small amount of material and the results we got from the demonstration system. The difference can be partly explained by the unrealistic testing conditions in which we tested the materials first, but also by component design, which was too little adapted to the application itself. Our recently started Task 58 focuses on both – on improving material testing and identification and on component design and analysis to reveal the sources of performance degradation. Solarthermalworld: Solar chillers and adsorption heat pumps are ahead of TCM storage tanks in terms of technical maturity. Can researchers benefit from knowledge about the components of these devices? Fumey: It had been our assumption that available heat and mass exchanger (HMX) designs of chillers or heat pumps could be slightly adapted for sorption heat storage. But we understand now that this is not going to work and that we will need new and innovate designs instead. Critical parameters are a wide contact area and long contact time between the two reactants, the sorbate and the sorbent. For example, the contact time of a sorbate such as water vapour is not long enough in a conventional heat and mass exchanger to allow for sufficient differences in absorbent concentration in a liquid sorbent. Additionally, a low absorbent flow rate leads to poor wetting of the tube bundle. Another major difference between storage applications and sorption heat pumps is the option of circulating the absorbent. Whereas a heat pump achieves high flow rates and turbulence by recirculating absorbent through continuously pumping it from the bottom of the HMX to the top, such a scenario is not possible in storage, as mixing fresh and half-processed absorbent will strongly decrease the output temperature. Solarthermalworld: The typical sorbate in a cooling application is water vapour. What materials are you analysing to act as the sorbent? Fumey: The sorbent can be either solid or liquid or, as is common with salts, change from solid to liquid during sorption (heat release) or vice versa during desorption (charging). Previous research endeavours – for example, the EU-funded COMTES project (link) – have taught us quite a bit about zeolite as a solid and sodium hydroxide as a liquid sorbent. Porous zeolite has shown high storage capacity (up to 180 kWh/m³) when charged at 180 °C and will have output temperatures of up to 75 °C during discharge. Sodium hydroxide is studied because of its high availability, low cost, and potentially high storage capacity of between 300 kWh and 430 kWh at charging temperatures of below 80 °C and discharge ones of 45 °C. These two materials will also be employed to showcase component design development of TCMs in our research group in Task 58. Basic functionality of a heat and mass exchanger in an absorption TCM storage tank (liquid sorbent). The image on the left shows the charging, the one on the right the discharging process. Solarthermalworld: The HMX seems to be a very special component. Can you describe its functionality? Fumey: The HMX is used to transfer the heat and transport the sorbate. It has two modes of operation: During a charge, it transfers solar heat to the sorbent and removes water from the absorbent by evaporation (diagram on the left). During a discharge, it does the opposite. 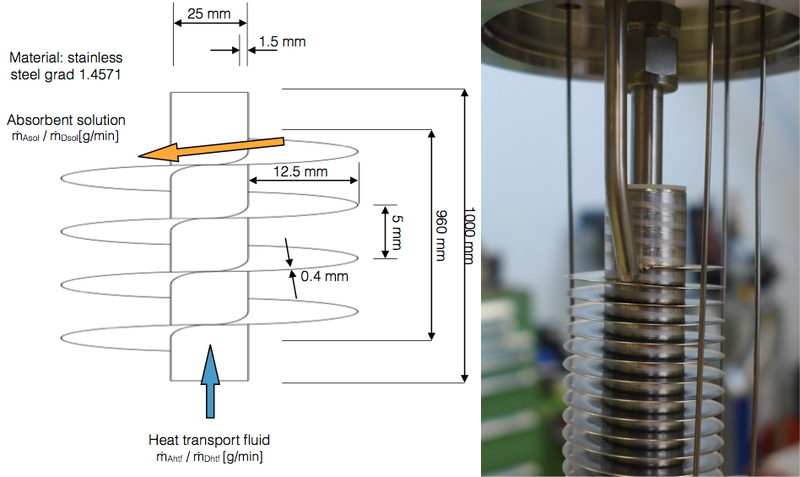 The water vapour is transported to the sorbent for sorption and the heat released by the process is transferred to the customer’s distribution system (diagram on the right). 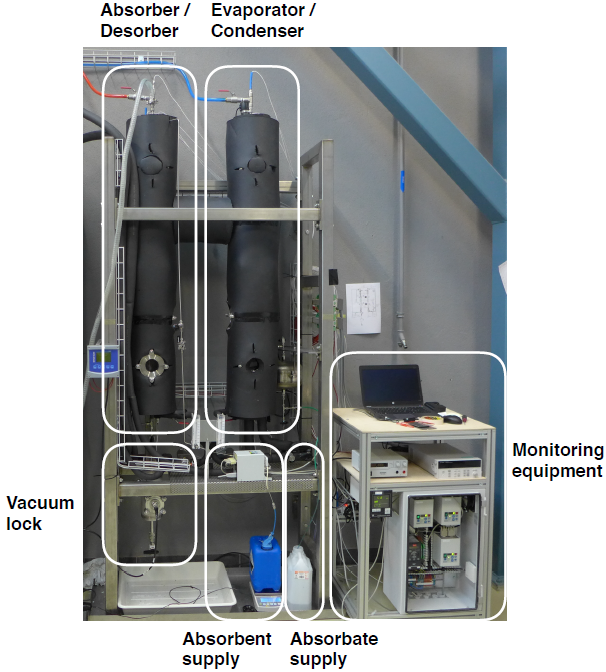 The HMX consists of two major components, an absorber/desorber unit (left) and an evaporator / condenser unit (right) connected by the water vapour exchange. The example system we describe here has sodium hydroxide as its sorbent and water as its sorbate. Both liquids are stored in separate vessels in the charged state and are combined when discharging occurs. In charging mode, solar heat is used to evaporate water from an aqueous sodium hydroxide solution. The water vapour changes to liquid in the condenser and the heat is released into a heat sink. During a discharge, heat is sourced from the ambient air to evaporate water at low temperatures. The water vapour is then absorbed by the concentrated solution and the heat released during condensation produces a temperature increase based on the absorbent concentration. This heat can later be used for space heating and domestic hot water. Prototype of a heat and mass exchanger suitable for a TCM storage tank and filled with sodium hydroxide (absorbent) and water (absorbate). At our Swiss institute EMPA, we have set up a prototype of an HMX suitable for absorption. It allows for extended contact between sorbent and sorbate, which means that the sodium hydroxide will absorb a high amount of water vapour, greatly increasing heat storage capacity. We have found a suitable HMX design in form of a vertically installed, standard-fin tube heat exchanger. When the absorbent comes into contact with the fin, spirals lead it slowly as a thin film down the tube. The heat transfer fluid will then circulate in the inner tube of the spiral. Design of the newly developed absorber/desorber of the heat and mass exchanger for a liquid sorbent. Solarthermalworld: Do the designs of the heat and mass exchanger differ for absorption (liquid sorbent) and adsorption (solid sorbent)? Fumey: Absolutely. Regarding liquids, the transport of mass is crucial and it is always closely intertwined with thermal conduction. In solid sorbents, thermal conductivity is the limiting factor and heat exchangers often divide the material used in the tank into small segments to guarantee the complete removal of heat. For example, in EU project COMTES, we used a copper heat exchanger in the shape of a spoked wheel around a vertical axle at the centre of a zeolite-filled storage vessel. This is an entirely different design from the spiral-shaped HMX one in a sodium hydroxide-filled storage tank. In our Task 58 research group, we are working to identify various processes and suitable HMX designs developed by the participating researchers or in scientific literature. Our objective is to set up an inventory of actual component designs which are currently under investigation. This report is planned for next year. A sorbed substance (mostly water vapour); an absorbate is absorbed in a liquid, whereas an adsorbate is adsorbed by a solid. Device which provides the heat used by the sorbent to remove the water vapour while charging and to transport the sorbate to the sorbent while discharging and transferring the heat to the user.